Lost is the art of fermentation. This skill of the past is an amazing way to improve the digestibility of your food as well as increase the shelf life or storability of foods. Fermentation makes use of micro-organisms to break down cellulose and anti nutrient factors to enhance assimilation and absorbtion of nurtients. It literally makes your food come alive and helps to replenish the naturally occuring bateria in our guts ecology. This plays a key role in regulating immune function. In ayurveda fermented foods are used to treat bowel problems including constipation, diarrhea, gastroenteritis and also can be helpful in preventing ulcers. Yes I realize leaving food out on the counter to literally start growing seems risky with concerns around botulism. 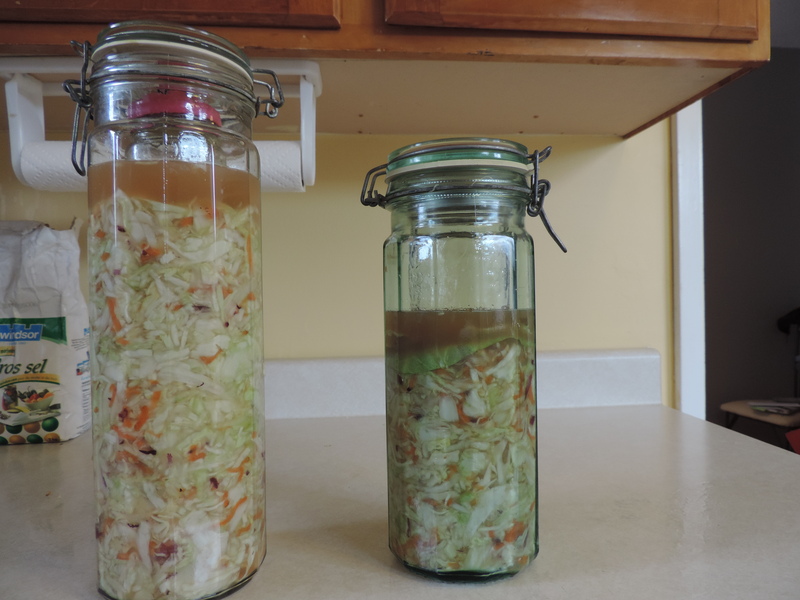 But don’t fret the good bacteria will far out perform the bad bacteria leaving fermented foods tasty and ready to eat. Although if your final product smells like a rotting, stinky, spoiled slop of mixed mushy veg then there is a good chance your batch has spoiled. It would be a crime against wisdom to eat it. 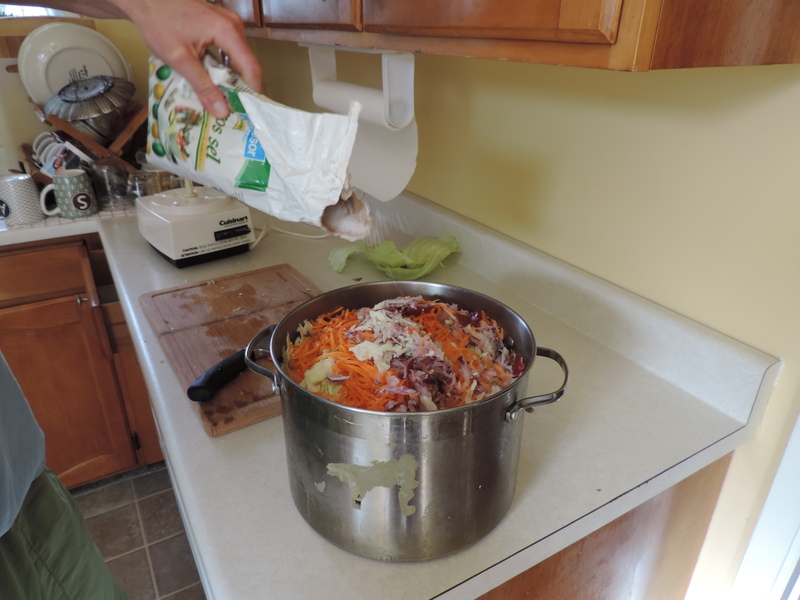 I’ll include the most ridiculously simple sauerkraut recipe that is a staple in my kitchen and fridge. 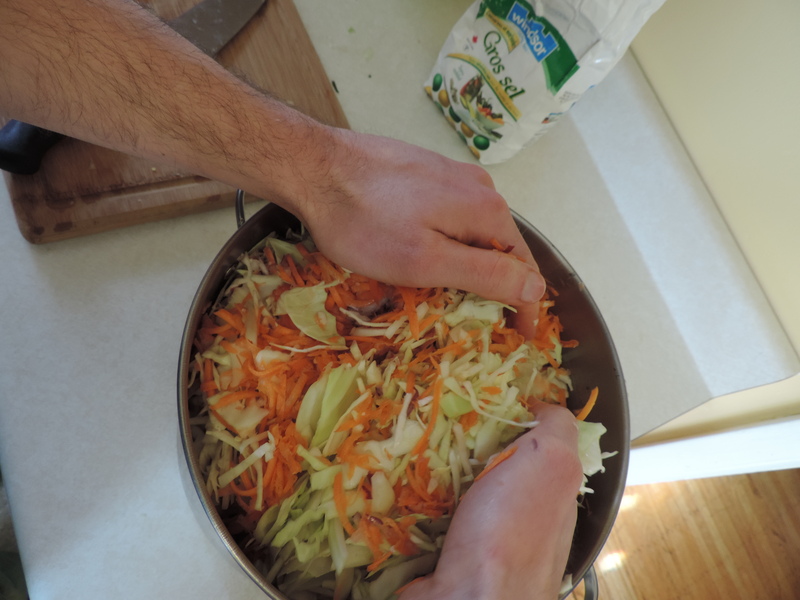 Chop or food process everything up into a fairly fine slaw (not that important chunks are fine). Mix in the sea salt and combine/toss everything together. Let sit for 15 min so salt starts to pull out water from vegetables. 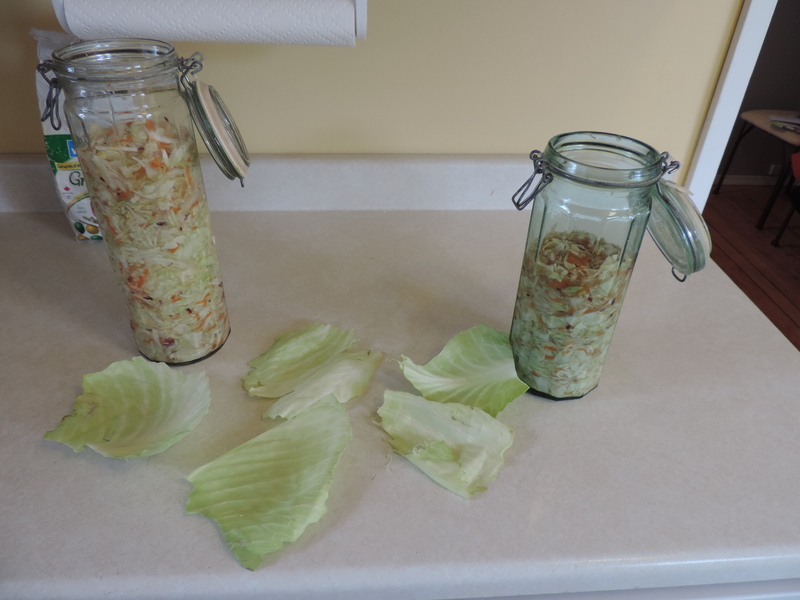 Stuff into large glass gars so much that the extracted juices and water rise above the compacted mixed slaw. 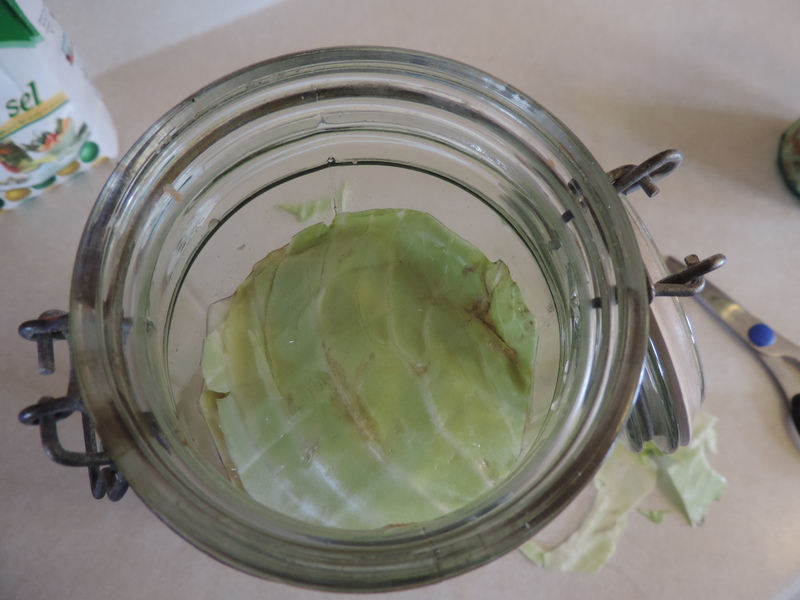 Place some whole cabbage leaves on the top just to keep loose pieces down. I usually place a jar or weight on top as to keep everything under the juices. 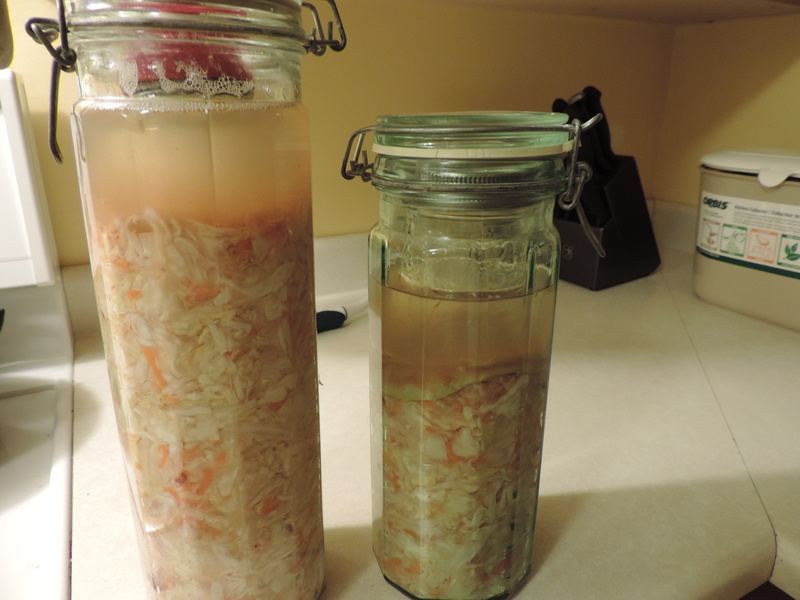 Let sit in a cool place (my counter in winter/my basement in summer) for 1 week from crunchy sauerkraut or 2 weeks for more tangy and slightly softer sauerkraut. Keeps in fridge for up to 3 months.!! Enjoy!! Pics Below!!! Try it cooked lightly in ghee with cumin seeds for a tasty addition to any meal. This article is not stating the best/only yoga, or spiritual path. The word Yoga can be translated to mean union or intimacy. Through different kinds of practices the goal of Yoga is to explore the connection and relationship between body (physical), mind (consciousness) and soul (universal consciousness). When we deepen the relationship and experience between these 3 aspects of our selves there is a sense of contentment and bliss. Through the intelligent awareness of body we can align ourselves into deep states of relaxation and experience profoundly calm states of consciousness without the constant chatter and fluctuation of the mind. The nourishment and pleasure resulting from calming the mind guides us to adjust our lifestyles to experience it more often. Finding a union or intimacy with this most blissful state of mind is the goal of yoga. Everyone has heard of Yoga and its popularity has exponentially exploded into an overwhelming market. Now sold as a service Yoga is branded into different stlyes like; ashtanga yoga, power yoga, bikram yoga, iyengar yoga, sivinanda yoga, kripalu yoga, Bob yoga, Jenny yoga, and thousands and thousands more styles and brands created all the time. For the most part all of these styles focus mainly on the physical asana practice, or stretches and poses we do on the yoga mat. Also there is less attention paid to the more subtle experiences of yoga practice like states of consciousness and movement of energy. A small problem is some of these practices are too strenuously fitness based or difficult in the beginning for the average person new to yoga to succeed in achieving the asanas (poses) correctly. The fruits (therapeutic benefits) of the practice are lost unless we can perform the practice with a balance of integrity, steadiness, and ease. Lost in translation among the studio yoga offered is the point of yoga, finding a clarity in the mind. The postures remember are just tools to help us be comfortable in the body to then focus on the mind. Asana (posture) is only a small part of Yoga practice. There are many different practices. The 8 limbs of Hatha Yoga include Yama (ethical standards), Niyama (self discipline/spiritual observances), Asana (posture), Pranayama (breathing practices), Pratyahara (withdrawal of senses), Dharana (concentration), Dyana (one pointed focus/concentration), Samadhi (enlightenment/bliss). Outside of the hatha path there are other Yoga practices including Karma Yoga (yoga of selfless action/service), Bhakti Yoga (unconditional love or devotion), Raja Yoga (follows the 8 limbs of hatha yoga) and Jnana Yoga (Yoga of knowledge or wisdom). Clearly there are more options for our yoga practices than just Asana (poses). A point that must be made clear is every person is uniquely different and will need to find a practice that provides a progressive path towards physical and spiritual contentment. In other words find a practice that is enjoyable and works. Traditionally yoga was transmitted in a one on one basis. It was taught to the level, and ability of the practitioner. Although guidance is necessary to learn different practices of yoga we need to tune in what practices are working for ourselves. This means our Yoga practice should be completely adapted to suit our individual nature and support the lifestyle in which we live. This shines light on the opportunity for us to explore what Yoga practice means to us, and most importantly, what works. Yoga will be the topic for our 2nd Dharma night at Live Yoga in White Rock on February 7th. Here is one of my favorite comfort foods for cold day where I’m craving something satisfying in my stomach. Start by toasting the fennel, coriander, black mustard and cumin seeds in a frying pan with a dash of oil. Toast until aromatic and mustard seeds begin to pop. Remove from heat and grind in blender or mortor and pestal. Soak chickpeas for 24-36hrs rinsing with cold water daily to germinate the legume. Then boil in water until desired tenderness is achieved. Set aside. In a large soup pot heat oil, and add garlic and ginger. Next add onion, mixed ground spices, curry powder, ground pepper, and garam masala. Cook 5 min or until onions turn slightly translucent. Option here if you eat meat to add chopped chicken breast or meat of your choice. Next add Carrots and Cauliflower cook for 10 min stirring occasionally. Now add eggplant and simmer for another 10 minutes. Now add both the coconut milk and broth for a soupier consistency. Bring to simmer and reduce heat. Next add the apples and raisons. Finally add the red pepper and reduce eat to min. Let the pot mingle for at least an hour on lowest heat. Add salt and pepper (maybe even a dash of brown sugar) to taste.